In post 8723, Klick wrote: So what actually happened in this episode? The votes make no sense based on the narrative we were given. 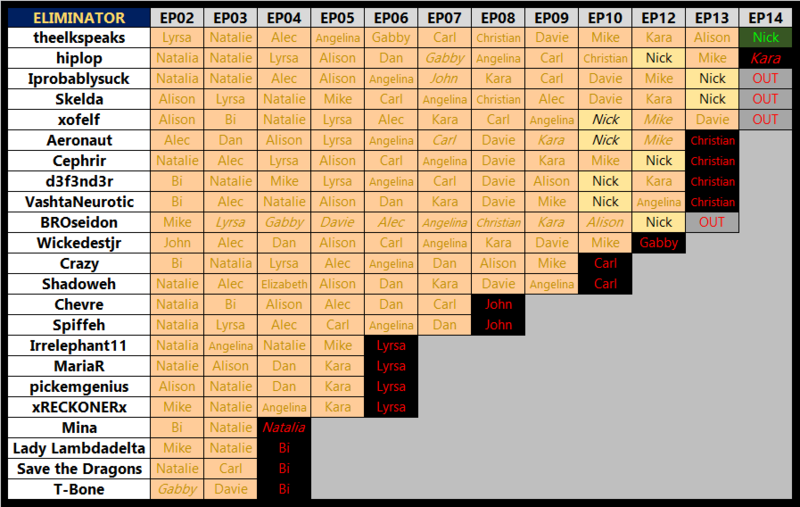 Christian/Davie were the status quo Alison voters, that makes sense; but Mike and Alison voted for Davie, and Nick/Kara/Angelina voted Christian. I don't get how these groups of people wound up voting the way they did. The only explanation I can think of right now is that everyone went against Christian and Davie, splitting the vote on the two of them. But that doesn't quite seem right. In post 8712, Irrelephant11 wrote: Complex tribe theory??? Can someone briefly explain to me what this is? Because I feel like I could make the argument that any of the pre-merge tribes were reasonably complex... is there always a consensus in the Edgic community about what the complex tribe is while a season is airing? Is it about positivity, too? What's the criteria for a complex tribe, exactly? It was also all this talk about there being a "winner scene" in the first episode that put me on to Davie early on this season... so I'm wondering if this complex tribe stuff is something else I'm missing. I thought David was a lot clearer than postswap. If a goliath somehow won I would ignore that theory for the rest of time. In post 8729, Cephrir wrote: I thought David was a lot clearer than postswap. If a goliath somehow won I would ignore that theory for the rest of time. Oh if Nick loses to Davie I'd be thrilled. I think Davie might be a slightly better player actually. But editwise it makes no sense, I do not see Davie being presented like this if he won. I'd be happy with any winner I think. I guess I don't particularly want Mike to win, but if he somehow did at least we'd all be surprised. None of these players remaining seem like they would be especially great winners, but I guess that's okay. I don't think a strong winner is a requirement for a good season, and usually I'd say good seasons tend to have worse winners. I'd be generally happy with anyone winning, though I do hope the winner isn't someone who only makes it to the end by virtue of idols/challenges/firemaking in these last couple of rounds. But I'm just saying that because I'm still reading a Davie win and I'm not sure how else he gets there. IMO his edit is a lot more generous than his actual game has been. Kinda pulling for anyone-but-Nick at this point. In a season where I’ve been surprised multiple times by my of-the-moment winner prediction going home, I’d be much more satisfied if he also lost. That said, I predict Nick will win. I kind of agree with you and Nick's been my winner pick for a long time too, but I really do think he wins and I like being right so it isn't so bad. I would love Davie or Kara to surprise us though. Actually at the finale, Sia is going to show up and give Angelina her jacket. Also, from an edgic standpoint, I think this makes Nick the first winner to have a mixed tone in the premiere? I felt the same way about Mike's speech. Lots of rambling and word vomit that meant and said nothing. Not a super exciting winner, but one of the all time great seasons. Not sure it edges out anything in my Top 5 (HvV, PI, Micronesia, China, and Cagayan) but I could see it getting better with age and supplanting either Cagayan or China eventually. I actually thought this was a great finale. It made me question what I already believed and did a pretty good job establishing Mike as a threat for someone who was never all that likely to win. It also cranked up the Angelina villain arc which made it that much more satisfying when she lost.